Sustainable Bainbridge hopes to bring a community FM radio station to the island. The nonprofit group plans to submit an application for a low-power broadcasting license in October. Tonight, Sustainable Bainbridge is gathering ideas on how a radio station could serve the island and what types of programs islanders would like to hear. A meeting is scheduled for 7-8:30 p.m. Tuesday at the Waterfront Park Community Center. You can find more information on the Sustainable Bainbridge website. Written comments and letters of support can be sent to info@sustainablebainbridge.org. We’re interested in hearing your ideas as well. Please take our poll and or leave us a comment below. What would you most like to hear on a Bainbridge community radio station? Planning for a revamped Waterfront Park will continue Sunday with a second community workshop. The event runs 1:30-4:30 p.m. at Waterfront Park Community Center. Islanders can join a walking tour of the park and dock at 1 p.m. The city and Sustainable Bainbridge launched the planning effort with a well attended community meeting June 1. Prolific walkable communities consultant Dan Burden helped guide the conversation. Participants brainstormed ideas for the park and voted on their favorite design elements (you can see the voting results here). Sunday’s workshop will include presentations from specific user groups. 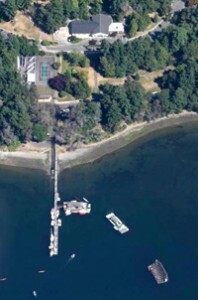 Bainbridge Island Rowing has a proposal for a new boathouse. The city’s advisory Harbor Commission is promoting designs for an expanded city dock. The city dedicated $1.8 million of a Washington State Ferries settlement to reinvigorating the downtown park and will seek additional grants. A request for qualifications from design firms was recently issued for the project. What do you want at Waterfront Park? The city has money to spend on Waterfront Park, thanks to a settlement from Washington State Ferries. Now it’s up to islanders to decide how to spend it. The city and Sustainable Bainbridge will host two community meetings in June to discuss renovation plans for the downtown Winslow park. The first meeting is scheduled for 1:30-4:30 p.m. Saturday at Waterfront Park Community Center. Participants can join a walking tour of the park at 12:30 p.m., before the start of the meeting. The stroll will be led by Dan Burden of the Walkable and Livable Communities Institute, who is helping facilitate the outreach event. There are sure to be many visions for the park. The uplands and shoreline are enjoyed by walkers, picnickers, concert-goers, rowers, day sailors, kayakers and visiting boaters, to name just a few regular user groups. The city’s advisory Harbor Commission has already presented a proposal for an expanded city dock. The Saturday meeting, dubbed “What could it be?”, is intended to be a brainstorming session. The second meeting – “How should we design it?” – is scheduled for June 30.